Britain’s Portable Antiquities policy: an intimation of journey’s end? At long last an academic has said about detecting: “a disjuncture exists between law (which defines activities that are illegal) and morality (which identifies behaviour that is wrong).” Morality, see? We’ve been obsessing about it for years while academics and archaeologists haven’t. Now it’s in the academic mainstream and hopefully archaeologists will start saying it too, the simple proposition that wantonly not reporting finds is immoral. We ought to sue all three for plagiarism. Like us they risk personal abuse but what’s been said can’t be unsaid. It IS immoral to deliberately avoid reporting all your recordable finds and the vast majority of detectorists DON’T report all theirs. Sad that the Portable Antiquities Scheme still avoids saying either. Once, back in 2001, it was happy to say “The Scheme believes that people have a moral obligation to their heritage”, but that was quickly dropped to conform with the wishes of those who want reporting to be a purely voluntary matter, not a moral obligation. It’s been a bad choice, damaging to heritage, unfair to the public and in the end embarrassing to the Scheme. It has also been insulting to many reasonable detectorists for it is surely not true they’d record less if it was now said to be morally obligatory? Only people who are already determined not to record would react like that. If that is the case – and it seems very likely that it is – it would have to be said that the policy has been based on a massive misjudgement and needs to be amended. Which is why we see the three quotes as encouraging. A few more and we could be speaking of early cracks in the prevailing paradigm. The sooner the better. Perhaps academics hold the key. Institutions like Glasgow University’s “Trafficking Culture” focus on illegal activity. Maybe in the case of Britain they should study the impact of immoral activity, the knowledge loss from which is demonstrably vastly greater? Is wanton failure to report recordable metal detecting finds immoral? Or not? 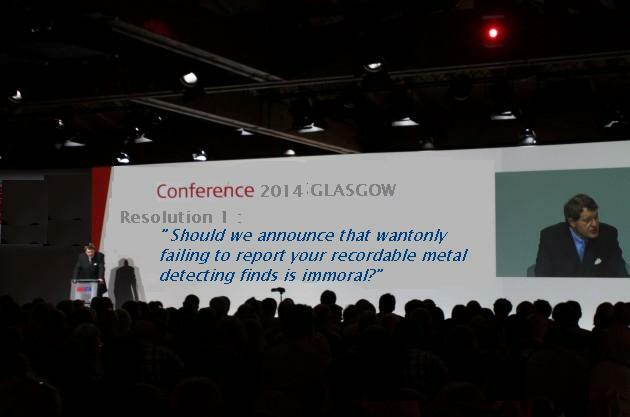 By happy happenstance this year’s Conference of the Institute for Archaeologists (“Setting standards for the study and care of the historic environment”) starts on Wednesday in Glasgow, the very place where the “metal detecting is a matter of morality” issue was flagged up. As a result we’re perfectly entitled to fantasise, nay ask, that the event kicks off with an emergency resolution….. If the timescale proves too tight perhaps other events could address the issue? Next month Egham Museum is holding what looks like a fascinating one day “Collections and Identity Conference” which would surely be ideal, especially as one of the themes is “What do objects tell us about their collectors”. Failing those two, surely some archaeologists, curators or academics will address the subject very soon? Won’t they? No support for statutory regulation to ensure the activity fully benefits the public interest, no soapbox here. We do note with satisfaction though that every time we make a really good point you pop up with a crude insult. You’re like litmus paper. Fingers crossed this represents a sea change. What you said seems reasonable ie good to record your finds. I fear that many detectorists just read these sort of posts as if you’re trying to send us all to hell and therefore come up with ranty replies that make them look even worse. ho hum. Quite. Some people react badly to a “reasonable” request that all detectorists should report all their finds whereas others of them think the request is “reasonable”. What lessons should society draw from that?! Well I guess it’s rather representative of society as whole, good and bad eggs. If that’s so then the question naturally arises: what should society do about it’s bad eggs? Spend one and a half decades asking them to voluntary become good eggs while never once saying being a bad egg is morally wrong?? And then when the one and a half decades is over and a lot of the bad eggs haven’t changed their ways, say OK we’ll give you another 15 years? Do you think that the taxpayer, if he knew that was the reality, would think that was value for money when the rest of the heritage sector, full to the brim with good eggs, is utterly skint? I think the obvious thing that needs to be put in place is compulsory recording of finds. If people are given the option to be lazy they will usually take that option, its just the way people are, always taking the easy option. If that option is taken away and people now find themselves in breach of the law they turn from being immoral and lazy to criminal. Problem solved. I’m not sure re criminalization. 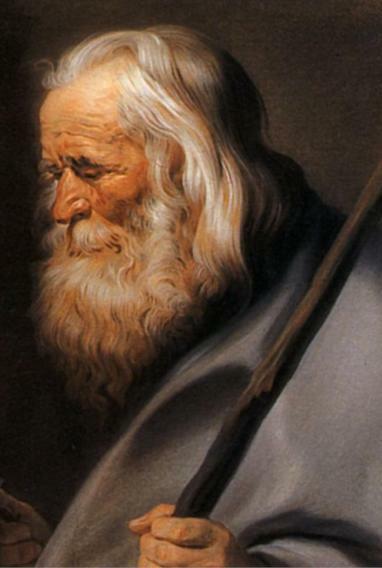 I think it would be hideous to enforce and is based on the presumption that, amoungst other things, you can accurately date everything 300 years or older. As to what it should do. Tricky one of course. Perhaps to continue to educate in a more effective thought out way. Increase the capacity to record (one would think FLO’s aren’t that enthuasiasitc about spreading the good word with a relative increase in their recording workload). Properly punish the illegal detectorists. If i was the taxpayer I would think would I get more value for money if it was spent elsewhere. If so do you a) let detecting carry on with no PAS relying on the good eggs in the heritage sector to educate the detectorists or b) ban metal detecting and pay to try and enforce it. Perhaps detecting is like alcohol, it can have its benefits but there will always be people that get too pissed no matter how much you tell them to stop and it’s just never going to be banned. Why would it be hideous to enforce? That’s the threat made by potential non-reporters, not reporters or potential reporters. It’s a silly, empty threat that PAS should be laughing at not repeating. No-one is saying let’s hang people who misjudge by ten years (or fifty). But the Treasure Act expects people to make a fair, honest stab at what’s Treasure and what isn’t. It works OK and no-one is persecuted for marginal errors. “Perhaps to continue to educate”. No thanks, I’ve paid enough for that. PAS has run into a reality they were always going to: the (large) rump who have no wish to co-operate. You know that, you’ve seen them. Join Central Searchers and read their rules if you think the rump can be persuaded to behave. I guess having been involved with giving legal advice for many years I’m hesitant when it comes to new laws. Call it immoral, irresponsible, but like drinking too much not illegal. Would it be metal only and if so why? If a 16 year old found an old bit of pottery whilst walking over a field would they be prosecuted for not handing it in for recording? What would the punishment be, would it be on a par with the Treasure Act? Who would prosecute? The coroner, the PAS, the Local Authority, The Police (but then is it a criminal offence as well?). Hard enough to get anyone interested if someone steals your phone let alone not reporting a 301 year old buckle. I don’t expect answers but I just don’t like using the law to solve problems. It’s too blunt an object which doesn’t always work very well. So if we don’t continue to educate what do we do? Drinking too much may be merely immoral or irresponsible but when it directly harms others, it’s illegal or legally regulated, and quite right. What’s wrong with that? Why should you deny society the right to protect itself by law from damage by artefact hunters, just as it does in all other areas? As for the details, you make it sound as if it is a blue sky notion that can’t be actioned because of the practicalities. Yet legal regulation of metal detecting is the norm worldwide. Britain’s laissez faire regime is a complete aberration that no country has sought to emulate, for obvious but officially unacknowledged reasons. So is a metal detector. No-one should be out in society’s back yard with one unless they are obliged, not asked, to keep to society’s rules. By what right should anyone claim otherwise? i don’t agree that drinking is legally regulated or made illegal when it directly harm others. One example, How many stories have you heard of a parent being a drinker and making their child’s life a misery by putting them down / not loving them? Not breaking any laws there but still directly harming them. Anyway analogies aside I don’t object to it being made illegal in theory. Wouldn’t affect me, hopefully! But due the practical difficulties and perhaps cost implications I like to think about other alternatives, of which as you say there may be none. Precisely! You have nothing to lose from having what you do already as a matter of conscience being made compulsory. You wouldn’t even notice a difference. The only people who would be adversely affected are the antisocial oiks who don’t do it and would be forced to. Show me a detectorist who bleats on about the importance of the voluntary system and the rights of a free born Englishman and I’ll show you a prat who doesn’t show all his recordable finds to PAS! The main problem os with the FLO’s them selves. When recorded items are not returneed , do not appear on the PAS site for years. Treasure cases sit unsubmitted in FLO’s offices. FLO does not return phone calls, emails , even after numerous requests. Why should detectorists waste time tring to record finds if they are treated as some kind sub human species by the very people employed to record finds. A viscous circle is now enveloping the whole scheme – I dont record because the FLO doesnt record ! I suggest you look closer to home for reasons that detectorists dont or cant be bothered to record.. The article is about the simple proposition that wantonly not reporting finds is immoral. Blaming others, or circumstances or the cost of bus fares doesn’t render it untrue. If you had bothered to read my comment. I agree that all finds should be recorded but the whole scheme fails apart when Finds Liason Officers do not do their job as first contact recorders . I have a treasure case that was submitted last July and the BM have no details of it . Who is failing in their responsabilities in this case then ? All detectorists defend the behaviour of the irresponsible majority by claiming “not me, not me”. It’s no defence. I don’t care what defects there are in the PAS system, real, unreal or exaggerated, most detectorists don’t report most of what they find because they’re intellectual oiks, not because they can’t. Coming onto a conservation website to tell us the mass information theft that your colleagues are guilty of is down to the FLOs is a massive joke. Oh diddums. Take it to a museum and donate it to them. Problem solved. Or is that too complicated? I DO NOT AND WILL NOT DEFEND the lesser responsible members of the detecting community. . I dont quite understand the term “colleagues” This is an insular hobby and I do it alone. No,they are NOT uninformed. I and other taxpayers have spent many millions “informing” them and they have ignored it. No, what I said was that they are intellectual oiks. Which they are. There’s no excuse for concealing and destroying everyone elses history. As for me being “an ignorant arrogant gobshite” it’s not me that is spraying such words around in order to avoid confronting and admitting that yes, actually, I would be better donating that treasure item to a museum rather than whining about the time it is taking to give me a reward. if I did I would be commiting an offence. All treasure when realised HAS TO BE REPORTED TO THE CORONOR of the district the object was found within 24 days. And yet you didn’t attach a note to it saying saying you didn’t want a reward? Do it now, today, send them a note. You’ll find the procedure will be much smoother and you’ll have no reason to blame the system in the self-seeking, pseudo-virtuous way you have. If you cant be bothered to show my comprehensive reply to your last statement, in which I stated the obstacles faced by the general public in recording finds and you prefer to pick a sentance out of context, I challenge your intellect. This is the behaviour of gutter press tabloid journalism and shows you to be a fascist bigot and that no one elses opinion is of any consequence. You did not state that I have said, I DO DONATE MY FINDS and assist in digs voluntaraly. DO NOT EDIT THEN CRITICISE OUT OF CONTEXT MORON. in the words of the great Barry Cryer, you sir are an ignoranus ! Blimey! Fine, insult us all you like so long as you now realise the FLOs are not to blame for non-recording and the law is not to blame for your failure to give up a reward. I am following this conversation and think that Mr Cole has a serious point about problems recording objects. Why are you fixated with his treasure reward ? Let me tell you that both finder AND landowner must be in agreement before this can happen. Saying you agree with him that detectorists can’t record because of the FLOs doesn’t make it so, it merely repeats the nonsense. Tens of thousands of amateur archaeologists record everything without difficulty, without complaint, without criticism, without inaccuracy and without 60% failing to do so. How do you and he explain that? Diddums, the poor detectorists can’t work out how to record because the nasty FLO prevents them. See how ludicrous the claim is to people outside detecting forums? As for being obsessed with his treasure reward, no, I simply noticed how inappropriate it was to complain about the Treasure system if you’re going to get a handout from the taxpayer. Let him just hand his find over with a note saying I want no share of it – then he’ll have no cause for complaint about the system will he? But no, he’s used every trick in the book, including abuse, to avoid agreeing he could do it. Plus ca change in detecting world. Too much talking, not enough doing right by the community. Apart from the self record system for PAS discounting city museums / universities what other options are there for amateur recorders. “He as finder can waive any reward”. Thank you. That’s the point, but he wriggled and wriggled and finally lapsed into crude abuse to avoid saying so. You havnt mentioned that I did say it was a ring FRAGMENT 3 gram of scrap silver approx value £1. why get so het up about such a small. amount Your ingnorance about treasure procedure is blaitantly obvious. Please do not make judgements on what you dont know. Also I see you have not enlighted us on the atlernative ways on how to record objects. You havnt mentioned that I did say it was a ring FRAGMENT 3 gram of scrap silver approx value £1. why get so het up about such a small amount which will be returned to me after recording. I observed the letter of the law in presenting a potential treasure object ( read the act for description )Your ignorance about treasure procedure is blaitantly obvious. Please do not make judgements on what you dont know. Also I see you have not enlighted us on the alternative ways on how to record objects. Oh dear, now it’s not the fault of the FLOs or the system or the law. Now we’re now told, late in the day, your Treasure reward (half of £1) is too small for you have told them you don’t want it and THAT’s why you haven’t sent that note disclaiming it!!! It’s just laughable. You could make a suit out of your tangled web. 1. Non recording is mainly due to the FLOs themselves..
Grrr. The deluded sense of entitlement from some detectorists is staggering (and saying we are morons and elitist ignorant arrogant gobshites doesn’t exactly convince me that he’s telling the truth about being a “responsible detectorist” either). i HAVNT STATED i AM A DETECTORIST. All my finds are from field walking. and why havnt you included ALL content I have sent ? “i HAVNT STATED i AM A DETECTORIST. “I DO NOT AND WILL NOT DEFEND the lesser responsible members of the detecting community. .
Stop assasinating the guy and answer his bloody question! I rather think it was he that repeatedly made him look foolish and dishonest, no-one else. As for the question, what alternative recording avenues do detectorists have, as everyone knows, there are many. However I don’t propose to dignify the nonsense about “it’s the fault of the law and the FLOs we don’t report” by discussing them. If PAS wants people to stop showing them finds they’ll say so but until then, since the taxpayer has paid millions to set up PAS, let detectorists show them their finds. No, not the 30% who already do so, the 70% who don’t – and find endless stupid excuses, as have been exhibited here. I think there is nothing more deluded than a sock puppet who is sure he’s making sense. Abusive time waster, nothing else. Yep, and with multiple manifestations. Sand for brains. I used to be patient but after the first few years when you can recite and demolish every ponderously made false claim off by heart it becomes hard. I must say though, blaming the system that keeps them from going to jail for the fact most of them don’t co-operate with the system that keeps them from going to jail is particularly irritating. Is there a hobby that’s more mollycoddled, more fortunate, less co-operative and more downright stupid? I doubt it. Not until they start subsidising egg collecting and sale. Right on time Paul, confirmation of what we both said. Being a metal detectorist myself, Ian is one of the detectorists I distance myself from. What a way to show yourself up in a public arena. Ian you have just made yourself look a complete doughnut and now given the critics the fodder they need. For anyone reading this please note we are not all like this. If his statement is true. Should this moderator be ashamed in their vanity editing. Nothing was “edited to fit our agenda”, we chose not to publish 2 repetitious and offensive postings but Mr Cole has been allowed to make his views very clear, using at least two identities and some awful language, so your criticism is groundless. No-one can be any doubt about what sort of views he holds and that wouldn’t be the case if you were right, which a moment’s reflection would have convinced you about. For anyone reading this please note we are not all like this. We never, ever said you were Andy. But there are a lot like him (you should see the stuff we don’t publish) and most detectorists don’t report, so damage history. Our one and only problem is the rest – the ones who know it but who won’t walk away from the others and won’t call for regulation. « Welsh government asks: should “Ignorance” no longer be a defence for damaging an Ancient Monument?